Chef Waldie received his Executive Chef Certification in 1981, a Certified Executive Pastry Chef and Certified Culinary Educator in 2000 from the American Culinary Federation (ACF). He now holds these as lifetime certifications. Chef Waldie worked in commercial, private and educational environments preparing American, French and continental cuisines. Serving as executive chef for a private estate he prepared extravagant dinners served on Rosenthal plates and Romanée Conti sipped from Baccarat glasses for dignitaries such as the Mondales, the Carters and a gentleman named Rainier Louis Henri Maxence Bertrand de Grimaldi (Prince Rainier of Monaco). He was fortunate to collaborate with professional and high profile chefs through partnership on television demonstrations with Chefs Julia Child and Graham Kerr. Other media opportunities included lessons with Chefs Wolfgang Puck, Paul Prudhomme, Mary Esposito and George Perrier to name a few. Further educational occurrences included many trips to France with students to further their studies on the understanding of culinary arts and classical pastry. Serving as a mentoring coach for ACF Junior Culinary Teams, he instilled students with a deeper knowledge and understanding of food preparation as they proved successful in ACF regional, national and Olympic (IKA) competitions. Culinary education became Chef Waldie’s calling and in 2005 Garry moved to Arizona with his wife Holly. 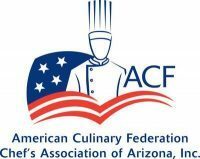 Transferring to Le Cordon Bleu College of Culinary Arts in Scottsdale Garry quickly moved from instructor to program chair (later renamed lead instructor) position. Chef Waldie presently administrates several online programs for Le Cordon Bleu bringing technology to the culinary arts and hospitality. Remaining involved with both ACF Arizona and ACF San Francisco local chapters he continued with student team mentoring, ACF certification and giving back to the community.